After starting off the NBA season as one of the teams with the best records in the NBA, the Portland Trailblazers now find themselves as one of the latest NBA teams to be struggling. 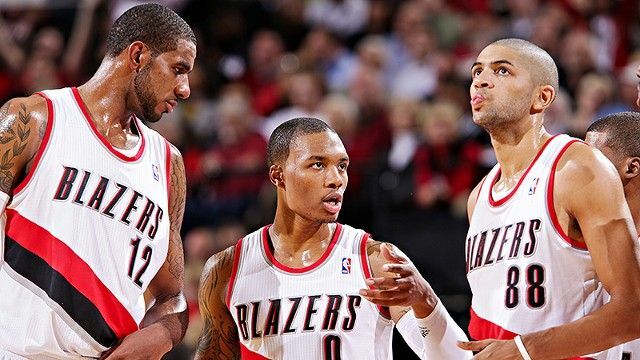 With the teams like the Miami Heat and Indiana Pacers going through some rough times and the overall presence of March Madness, the Blazers struggles can easily be overlooked. In their last 10 games the Blazers have been 3-7 and have had to deal without the presence of All Star LaMarcus Aldridge due to injury. Aldridge brings a whole lot of offense to the table, which is pretty hard to duplicate, 2nd year man Damian Lillard has tried to pick up the slack but he hasn’t been enough. Then we have to look at the fact that the Blazers were beginning to slide with Aldridge in the lineup. Currently the Blazers have a 45-26 record which isn’t bad at all but in the stacked Western Conference every win (and loss) counts at this point. The Blazers have are in the 5th spot but only hold a one game lead over the Golden State Warriors. I think the problem here is that the Blazers live by the three and die by the three. Whenever I watch this team play I see them take so many three pointers and they usually make them. Recently though the jumpers having been falling and the team has been struggling. It would be crazy for the team to change up their game plan now as they have been relatively successful this year. Also the bench that I thought was going to be very good this year turned out to not be all that great. The Blazers are definitely a good team but at this point we may not be able to call them elite anymore. Hopefully this team gets on track but if not and they continue to fall, one of those teams near the top of conference will have a pretty good Blazers team to deal with.